The Most Meaningful Photo of My Life was Shot with an iPhone. There is no photograph more powerful to me than a family photograph. When Leigh Beisch sent me this recent post, I told her it would be one of my most favorite posts ever. It needs no introduction. “I have owned various cameras over the years, starting in middle school and the Kodak instamatic graduating to a Nikon F2 when entering the photography program at RISD and now an arsenal of various format cameras both film and digital to meet the needs of my professional assignments. Ever since I captured one of the most meaningful shots of my life with my phone, I have found myself intrigued with iphonography (to give it an official sounding name). 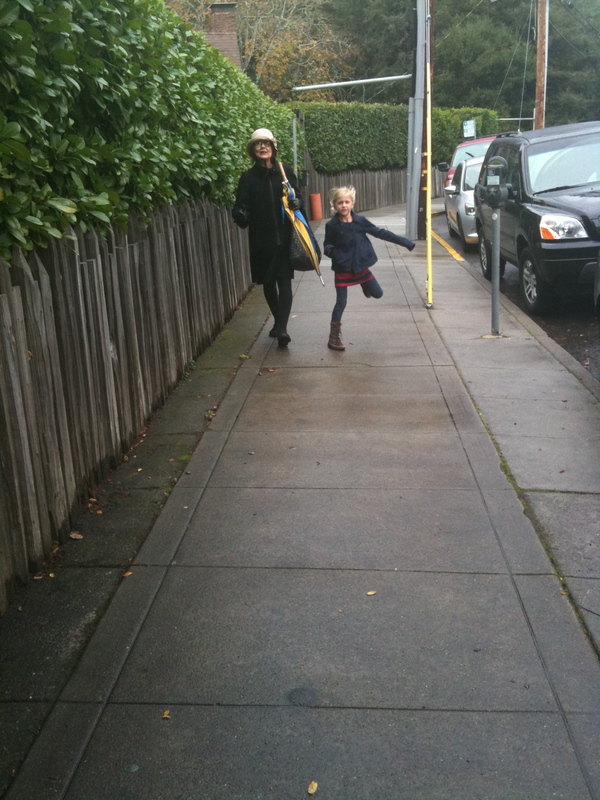 Back in 2009, a few months before my mother passed away, I captured a photo of her and my daughter walking back from church. I wouldn’t have thought to carry my camera to church, and honestly at that stage of her illness she was not all that open to having her photo taken – due to the wig and all. I happened to be walking in front of them on that rainy Sunday in Mill Valley, CA and turned around and saw them together- walking and chatting. I grabbed my phone and snapped the photo without them even knowing I was taking the photo. That photo later became an important one to many members of her family and friends because it truly captured her spirit, her strength, her beauty and her incredible connection that she had with my daughter. I was able to capture that brief moment unnoticed because of the camera phone. It is a camera that is not perceived as one so people act differently around it, they seem more relaxed, more like their true selves- not their “camera ready self”. Up until then I didn’t think too much of taking photos with my phone, now I use it for personal snapshots, personal projects and most recently for an editorial project. I find the “phone” to be an incredibly immediate connection to capturing the moment, the feeling, and the energy of the scene without all the technical maneuvering that sometimes needs to occur with more complex cameras. For me it is like painting, a direct, immediate and satisfying way of making art. And I love that it puts the power to make great photos in the hands of everyone! The power of capturing the world so effortlessly has in turn captured our attention. It has shifted how we communicate. We connect through images shared. Images of the real world, of real, raw moments that are most times unedited and un art directed. And yes, there are a lot of not so great images out there, but the power to create is infectious with time the images get better and sometimes develop huge followings Now they reserve seats at the US Open not just for the top sports photographers but also for the top instagrammers- ones who have hundreds and thousands of followers! When they called this the information age they had no idea how right they were. We have become impassioned with communicating with each other, in bursts of words on twitter/facebook/texts and now bursts of color, light and pixels in the form of instagram/iphonography. To see more of Leigh Beisch’sp photography and read her own blog, link here. Or follow her on Instagram at LeighBeisch.